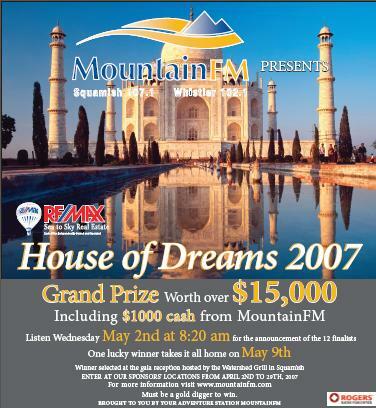 Some days are much better then others and Wed. May 9th will certainly go down as a good one for us, because this was the day that we won the 2007 House of Dreams Contest from Mountain FM! On May 2nd or so we got a phone call from the station - I had been selected as a finalist for the contest - which meant that we needed to travel up to Squamish and attend the dinner-party where the final draw would be held. 12 is Kellei´s lucky number, we were married at 12:12, we had 12 entries each in the contest, and they had chosen 12 finalists! As a bonus, on the way up to the dinner we even noticed that the super-7 jackpot was 12million and we earned 12 air-miles filling up the gas for our truck! - Fate was on our side it seems! The draw was a reverse draw - and we had to choose little cartoon houses that would be picked from the box. As each house was picked that person would be eliminated until three people remained. The last three had to choose keys to a door - and the one that opened it wins. The big ticket is a Hot Tub - and being right in the middle of building a Deck in the Back - this was PERFECT! There was also $1000 cash from the station a patio set, outdoor heater and gazebo, and wyatt even gets a dog house! All totaled it´s over $15,000.00 worth of stuff for the home. Easily the biggest thing either Kellei or I have ever won. So, that was our "Better Day then most!" We´ll keep you posted as we implement the goodies - but it will have to wait until after the IMRF conference in Sweden early June - more on that later.